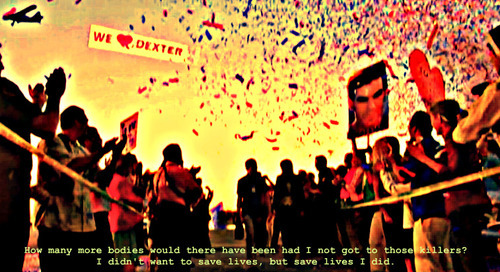 Rita threatens to leave Dexter if he does not commit to a program to deal with his drug addiction. He starts attending Narcotics Anonymous meetings, while still trying to evade Doakes' constant surveillance. At the meeting, Dexter meets a mysterious and flirtatious woman named Lila , who volunteers to be his sponsor. Doakes tracks Dexter at the meeting, but to Dexter's relief, Doakes displays understanding of the "addiction" and lets Dexter go. Later, he hunts down a new victim, Roger Hicks , a used-car salesman who murders beautiful brunettes. Lundy invites Debra to join the new task force investigating the Bay Harbor Butcher, and soon discovers a pattern to the murders. Whole or part of the information contained in this card come from the Wikipedia article "Dexter (season 2)", licensed under CC-BY-SA full list of contributors here.